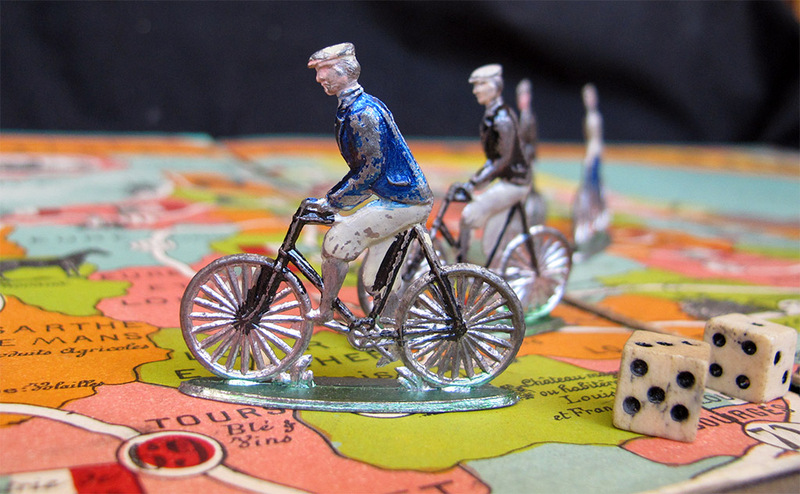 This is the first of a series of games by Saussine (see Jeu des Cyclistes, Jeu des Touristes and Tour de France Cycliste /Grand Rallye Touristique). However, this game does not have the name of the publisher. I am not sure how to interpret this. 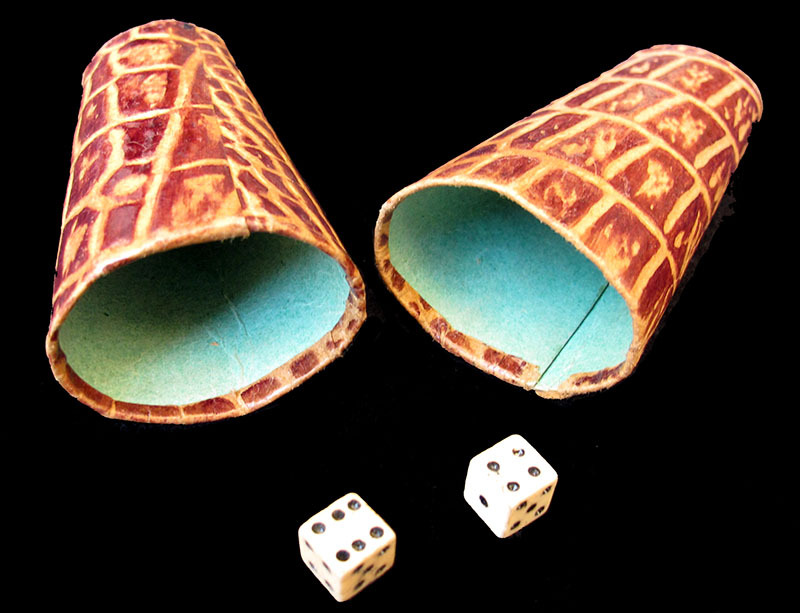 Maybe Saussine (which started making games in 1860) did not put his name on the games until later, or maybe this game was not made by Saussine after all. Or maybe the name is somewhere and I have not been able to spot it. Any comments are welcome. By the way, you can find a lot of useful information on Sausinne's games in Alain Rabussier's website. The board measures 79 x 64 cms (and the box measures 50 X 34 X 5 cms). 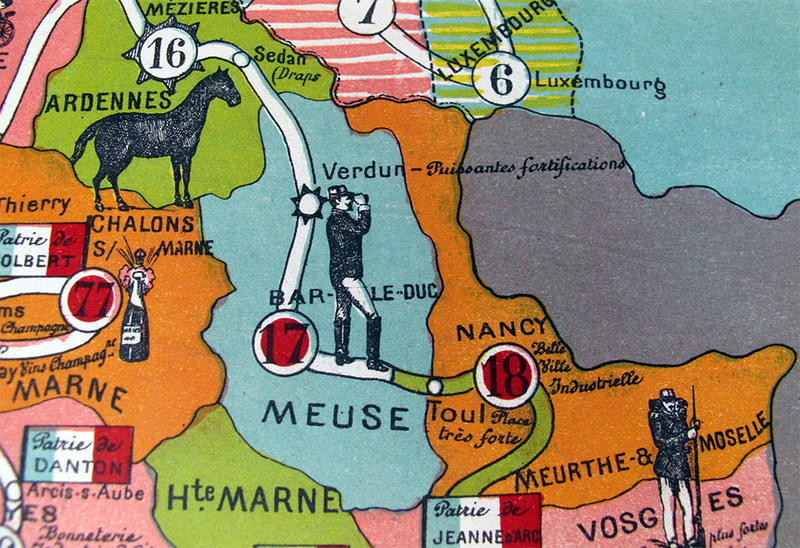 Unlike the three other similar games mentioned above, in this one the riders travel not only through France but also through Belgium. If you do not take this into account (and the redrawing of the board), the four games are basically the same. 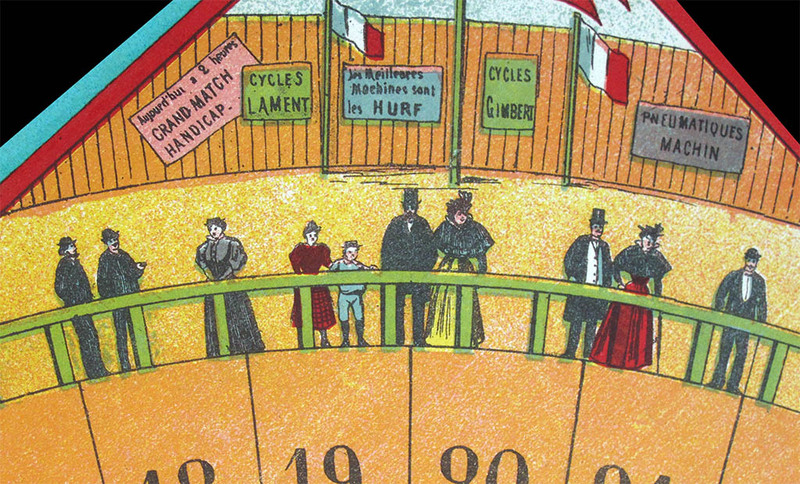 In my copy of the game, there are three male and three female cyclists, dressed in complementary colours, so one can assume that they form three teams. I just feature une female riders in the pictures because the other thwo are, sadly, beheaded, as is not uncommon in old lead figurines. However, I do have one of the two heads, so at least one of the female riders will be restored som day. 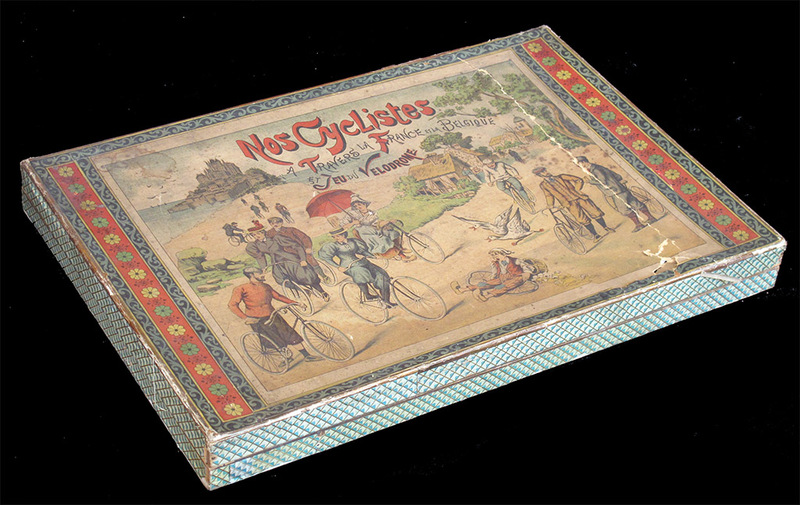 I cannot be 100% sure that trhe game is complete, but the contents of the box are so well preserved (apart from the beheaded females) that probably there were not more than six riders with this game. 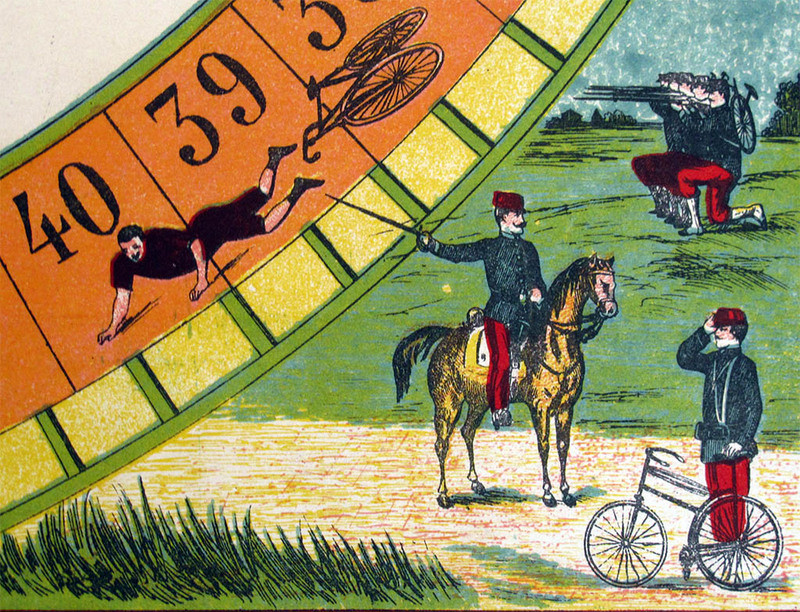 Besides, all the pictures I have seen of this game have six riders or less, and all the riders are of the same colour as the ones I have. If you compare the rules to the other games in the series (follow the links above) it is still more obvious that they are all versions of the same game. Notice that, here, the name of the game does not mention Belgium. 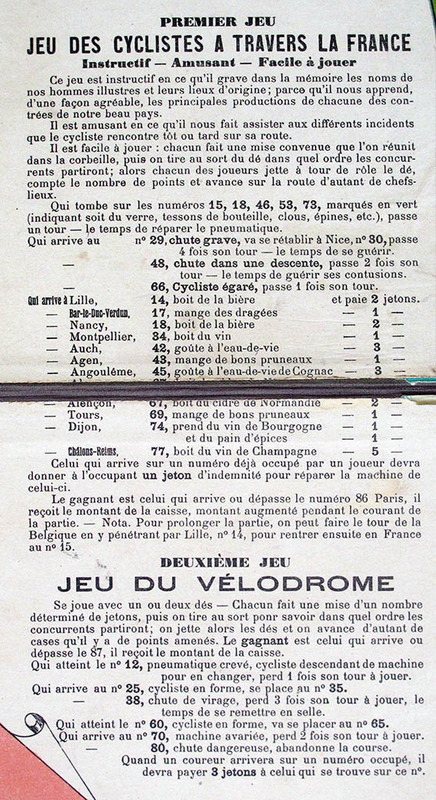 Track cycling was very popular in France in the last decade of the XIXth century. More than 40 tracks were opened in the country between 1893 and 1900. 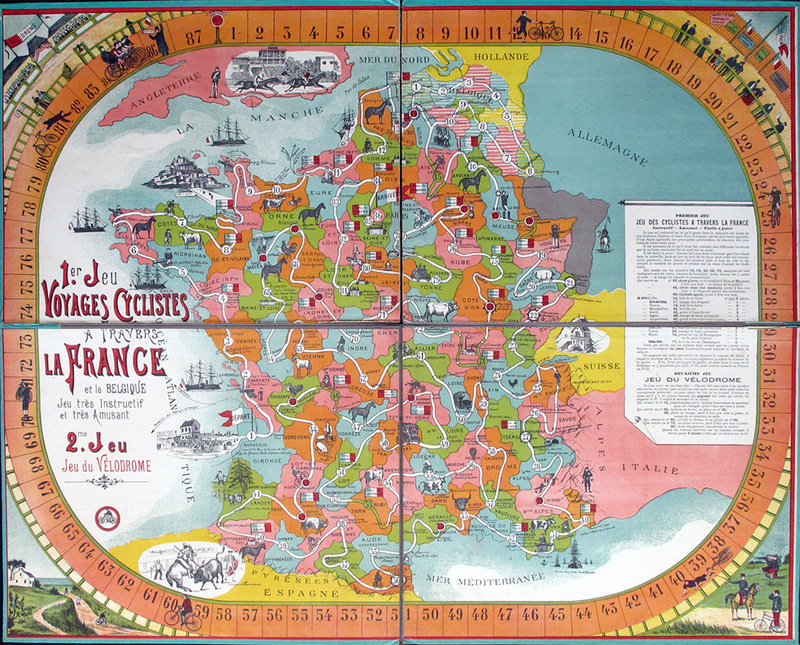 The game played on the map starts in Bordeaux. 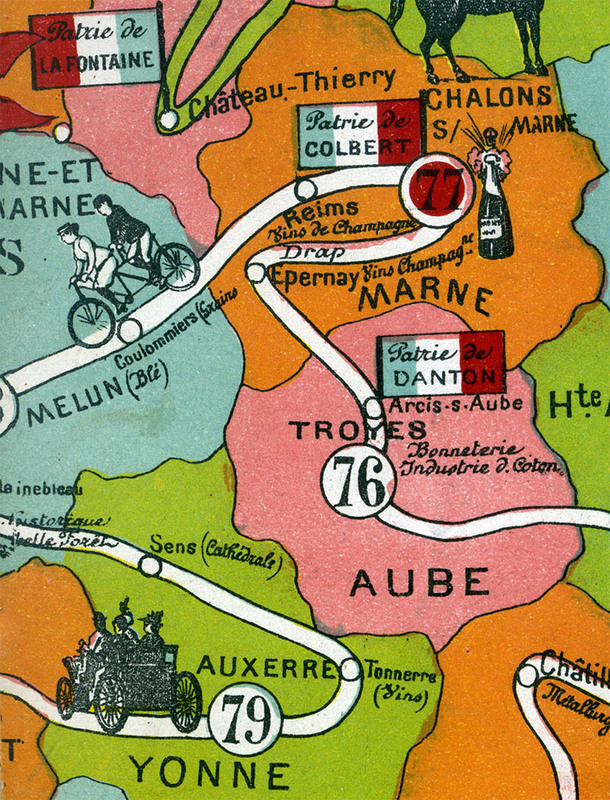 As you can see, the Bordeaux-Paris race is dmentioned on the board. 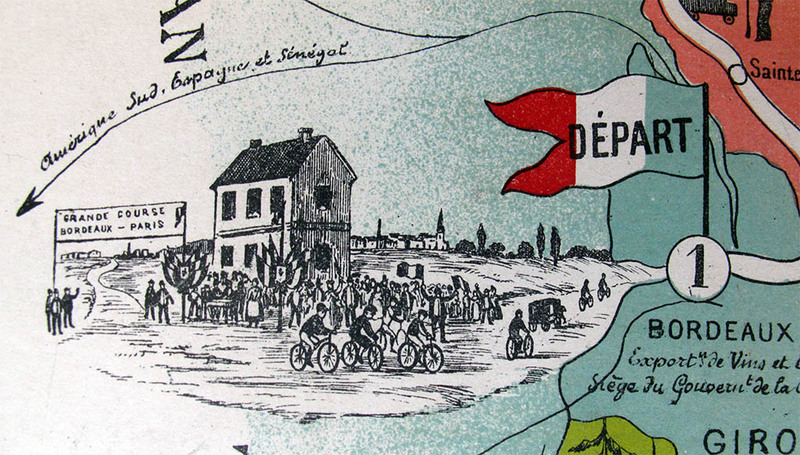 Of course Bordeaux-Paris is one of the most important early road races, first run on 23 May 1891. 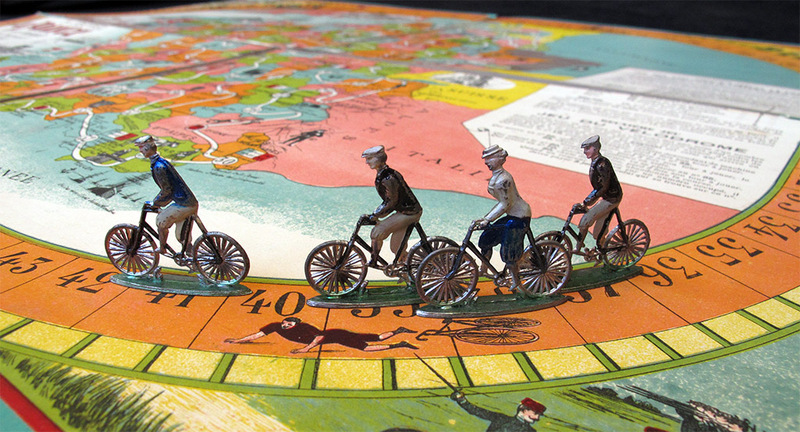 As a comparison, the Tour de France "only" started in 1903. 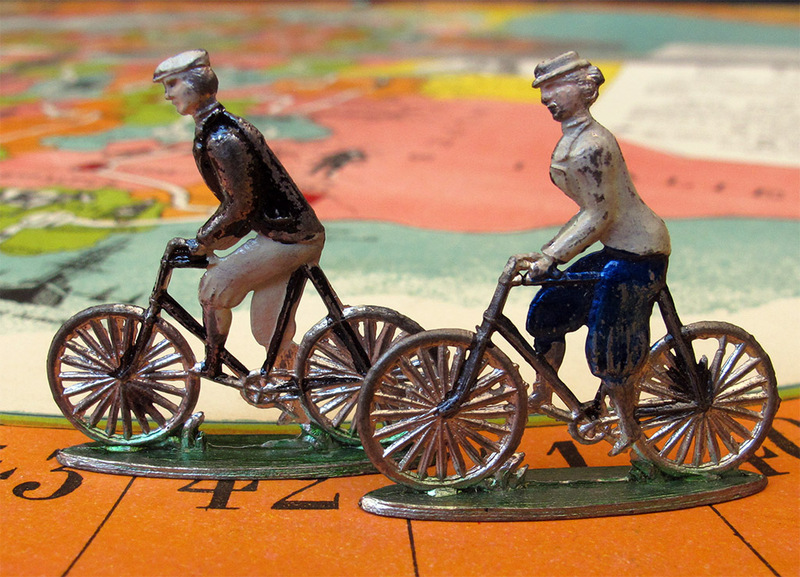 It is easy to suppose that, had the Tour de France been organized when this game was made, it would also be mentioned. This only car pictured in the game. I am not an expert but it looks like a XIXth century car to me, maybe an old Peugeot. Unfortunate composition: it looks like the soldires just shot the fallen rider. 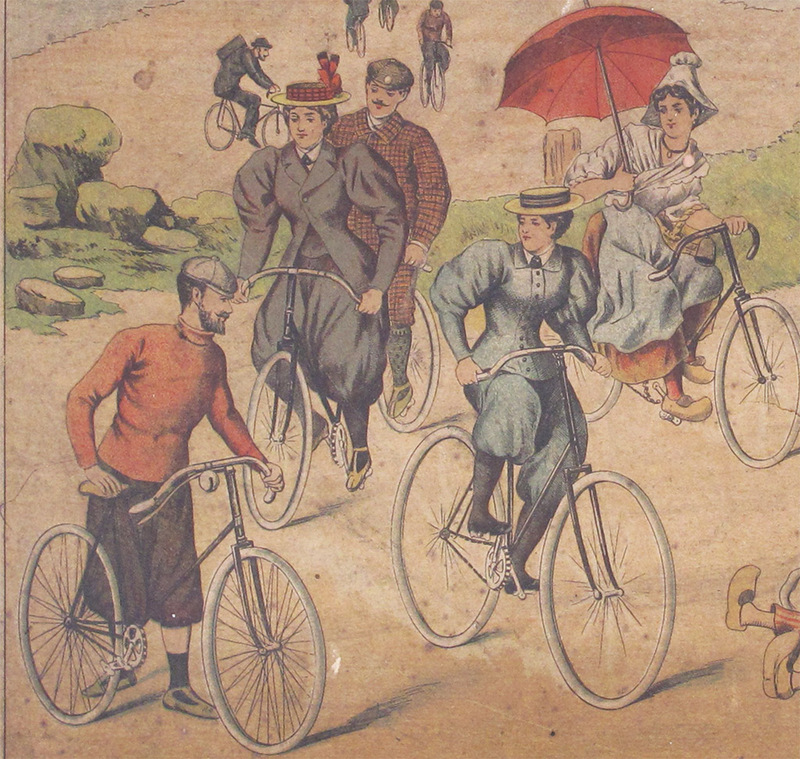 Notice a member of the cyclist infantry (which was created in France in 1892). 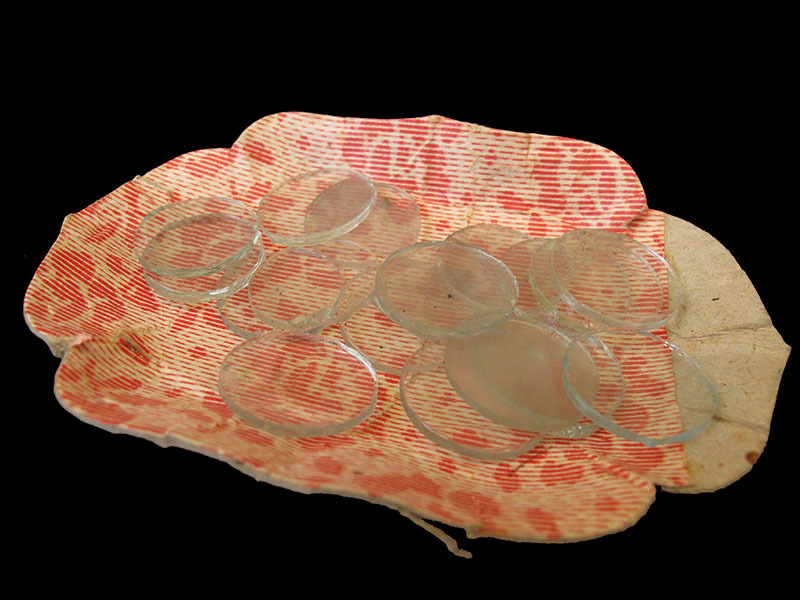 Original bone dice and goblets. 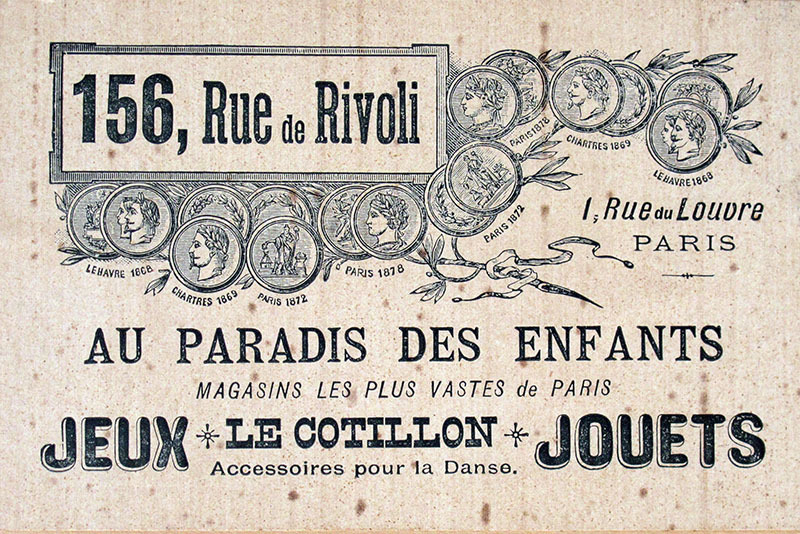 This game was sold in a classic Paris store. This label is glued to the back of the box cover.